Sassanian, Khusru I, AD 531-579. Silver drachm. Denomination : Silver Drachm. Mint : RD mint. Date : year-25 (AD 555). Size : 28.0 x 30.6 Weight : 4.05 grams. 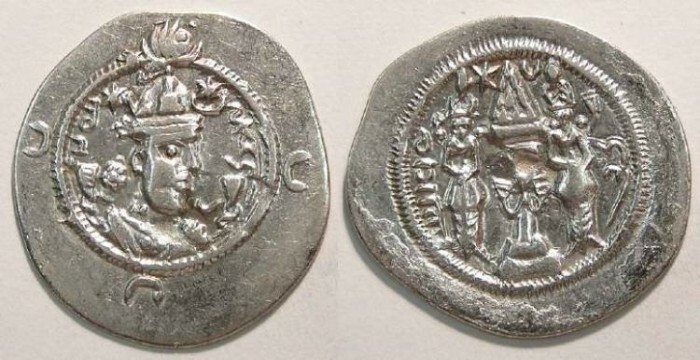 Obverse : Head of Khusru I right, with Sassanid inscription naming him around. Reverse : Fire altar flanked by two attendants, with the date to the left, and mint to the right, in Sassanid script.